During November (I think it was) I attended the first Cardiff homebrew club session (since then officially named R.E.B.E.L. – Real Enthusiasts of Brewing on Every Level – in homage to the creators Tiny Rebel) – at this meeting we were all kindly given a packet of Bouclier hops by another attendee, a chap from The Malt Miller. Given I had already decided to give beer brewing a go – at least once – I thought I may as well make the most of my new hops, so did a little research to see what would go with it and I settled on a pilsner. Boil 3l water and add 0.9kg of malt; stir until dissolved. Boil to around 210 degree Celsius. Once it has reached the temperature add 30g of hops and stir well. Keep on a rolling boil (constant) of around 210 degree Celsius for 1 hour (it should be safe to leave at this point, but keep checking every 10 mins or so and give a stir) – this liquid is called “wort”; pronounced wert, like dirt. Once an hour is up pour in to bowls (for me it fit into two large casserole dishes). The hops will make a big mess so I used a jug to remove the wort and sieved in to the bowls, then squeezed the wort from the hops. Put in the fridge and leave for around an hour until cool (you’re not supposed to do this as it can warm other foods but I didn’t have anything in there to worry about so do be careful if you do this). Whilst the wort is cooling sterilize your tools (fermentation bin, paddle, sample jar and syphon). Once wort is sufficiently cooled (not too much warmer than room temperature) put in to the bin and add the remaining (2.5l) water plus the sugar (100g) – this needn’t be any special sugar e.g. brewing sugar, any from the supermarket will work. Stir and then take a sample to measure the specific gravity. Add 30% of the vial of yeast and give another gentle stir. Close and pop on an air lock, then leave to ferment for around 2 weeks. Now it’s time to either syphon in to bottles or in to a bin for ageing – the guys at Tiny Rebel recommend only a week or two, so bottling is probably best unless you like to serve from a barrel. Whilst you’re doing this measure the specific gravity again to get your alcohol level and then get ready to enjoy it! This yielded enough for around 1.5 gallons, which perfectly fit a carboy (aka demi-john) – this wasn’t a coincidence! 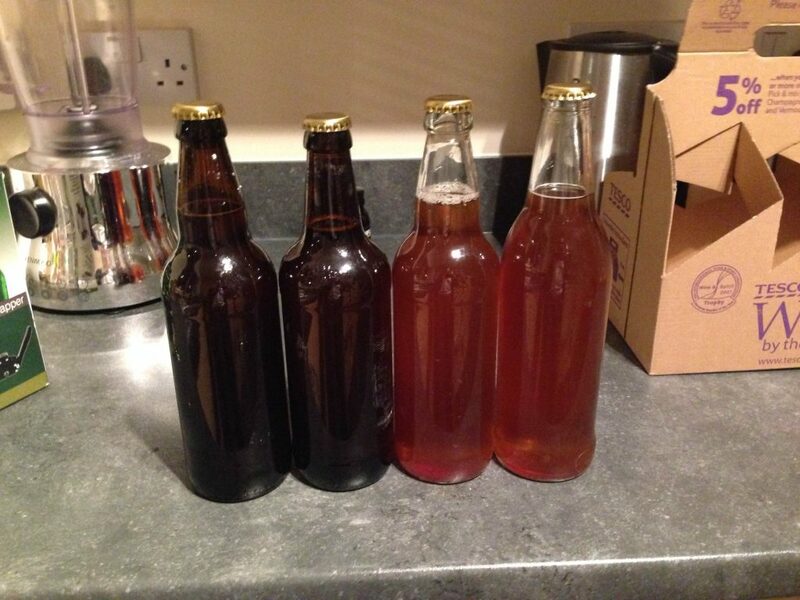 It took around 1.5 – 2 weeks to ferment, though I’m not sure exactly as it was bubbling for a while longer than usual, I put this down to the extra alcohol content created by adding the sugar. As you can see in the picture to the left there was an amusing moment when I went to check on the beer and found it had frothed over – lucky I kept it in the bath! During my second attempt (recipe 1) I had a large (5 gallon) fermentation bin so was luckily able to fit the remainder of my ingredients. However, I did only have the same pan and I quickly learnt that this would be a struggle. This time I boiled the water in a kettle and added the 2.1kg of malt extract to the pan; I then added the boiling water. This was a mistake as it made it very difficult to dissolve (see picture to the right), however with a lot of patience I was able to eventually do this. I was also only able to fit 2l of water in to the pan, but was able to add another 1l once the malt had dissolved. According to other sites it is best to have as much possible water in the wort to avoid burning it and changing the flavour – I would also add, make sure you have a big pan! At this point I then added the hops – you can see in the picture to the left that the dissolved malt extract was still very visible. After trying the different methods of dissolving the wort, I’m sure I don’t need to say that I really do recommend method 1. Boiling on the stove is fine, but if you get a bigger pan (I would recommend at the very least capable of holding 2 gallons) then you might find it easier to get a portable stove that you can keep lower to the ground.